Only a few days ago did Cleveland's Kid Cudi share some photos of the video shoot for his most recent single "Just What I Am" with King Chip formally known as Chip Tha Ripper. For this video Cudder makes his debut as a video director and showcases himself and King Chip cruising down the road with some female friends. 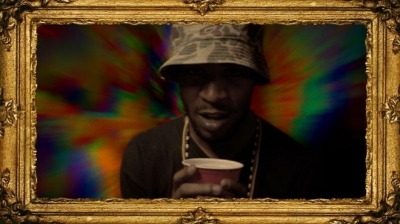 Yet, within the gold-framed clip, Cudi added in some trippy special effects, which is pretty cool. This track will appear on his fourth studio album, Indicud, set to be released sometime in early 2013.